Presenting! Towers of macarons delivered by a pair of adorable poodles. Ooh la la, your recipient deserves the sweetest of the chic on their special day, nest-pas? 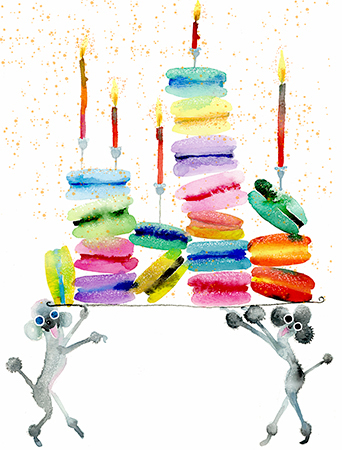 Macaron Poodles delivers deliciously festive mood with a touch of Masha D’yans signature whimsy for Birthday, Congratulations and more. Macaron Poodles is offset printed in USA with environmentally-friendly soy inks on luxuriously heavy, bright white matte stock, card measures 4.5×6 inches folded. The interior of this card is blank but features beautiful artwork on the back as well! The card and envelope are protected with a clear cello sleeve.